Right now in Los Angeles, Elon Musk is playing in the dirt with his shiny new toy, a second-hand tunnel-boring machine (“TBM”) named “Godot”. He hopes to revolutionize car travel by building highways underground, in “going 3d”. Musk’s antics have already drawn criticism from transit-planning experts. Jarrett Walker points out that Musk’s ideas are inherently anti-urban and anti-transit. Alon Levy shows that the technological claims Musk makes about tunnel technology are bogus: Musk seems to believe that there are a lot of low-hanging fruits to improve tunneling technology, whereas in reality, the technology is already very advanced. People tend to think it’s the tunnels that are the most expensive part of underground systems like metros, but thanks to the already existing TBM technology, they often represent only a small portion of the overall cost. Sometimes as little as 10%. The most expensive parts of subways are the stations. In my view, modern boring technology becomes interesting when we can use it not just for the tunnels in-between the stations, but to build the complete system, including the stations, cheaper. Musk says he can build tunnels cheaper if he just makes them smaller. But in reality, it’s not small TBMs that are the future, but big ones. The cost of a TBM doesn’t get much higher as you increase its diameter. Tt is therefore cheaper to build one very large tunnel, rather than two smaller ones. So giant, linear tunnel building factories have been constructed, with some reaching up to 17.6m in diameter. 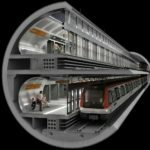 A large diameter tunnel becomes really interesting for the construction of a metro, if it is large enough to fit not only the tracks, but the station platforms inside it. This saves costs because it’s unnecessary to excavate large caverns, possibly dug from above requiring the purchase of a large amount of land. 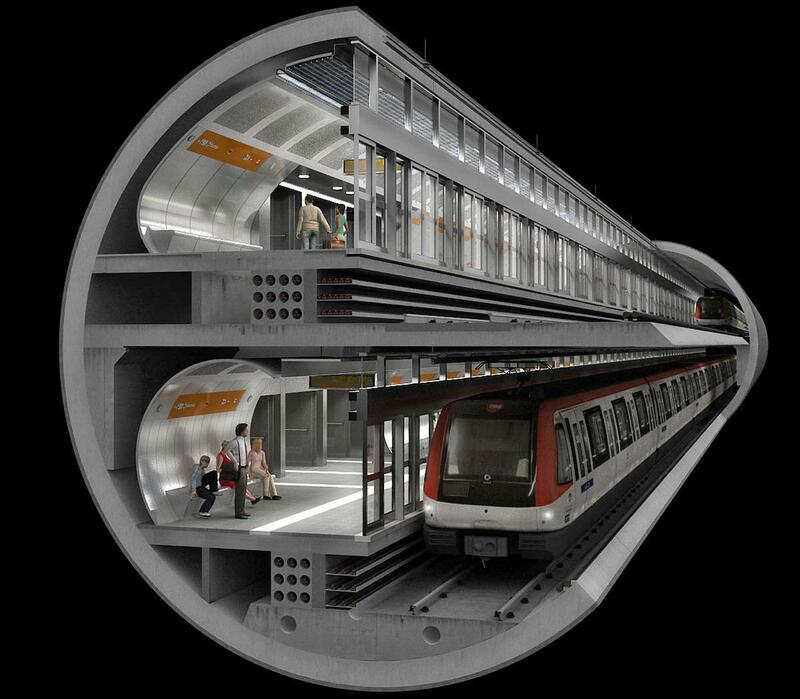 A large diameter tunnel was used for Barcelona’s line 9/10 project, where the tunnel is so big that two tracks and two platforms can be stacked above each-other, inside a single tunnel. These arge tunnel can also house other necessary infrastructure: siding tracks to park trains at night, ramps so trains can cross over from one level to the other, evacuation paths, power substations — all items requiring space and cost. 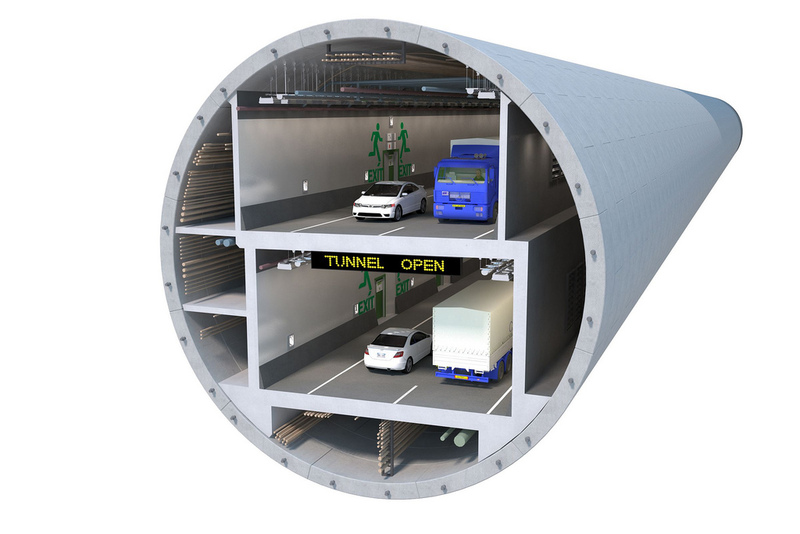 Other projects used very large TBMs to build tunnels hosting six lanes of highways on two levels, plus emergency evacuation and ventilation, all inside a single tube (Madrid, Seattle). There are also water or sewer tunnels. One interesting project in Kuala Lumpur, called “SMART Tunnel”, combines a four lane highway tunnel with a storm drain. During major storms, the road is closed and the whole tunnel is used to carry stormwater. Other projects combine rail and road in one tunnel. In Wuhan, China, a twin-tube tunnel under the Yangze River, currently under construction, combines a highway on the upper deck with a metro line on the lower one. Let’s say you’ve built your metro line using a giant TBM, and installed platforms inside the tunnels — you’ll still need to access those stations from the surface. Traditionally, you would dig some access shafts. This may be slow, labor-intensive, and complicated if there’s ground-water. 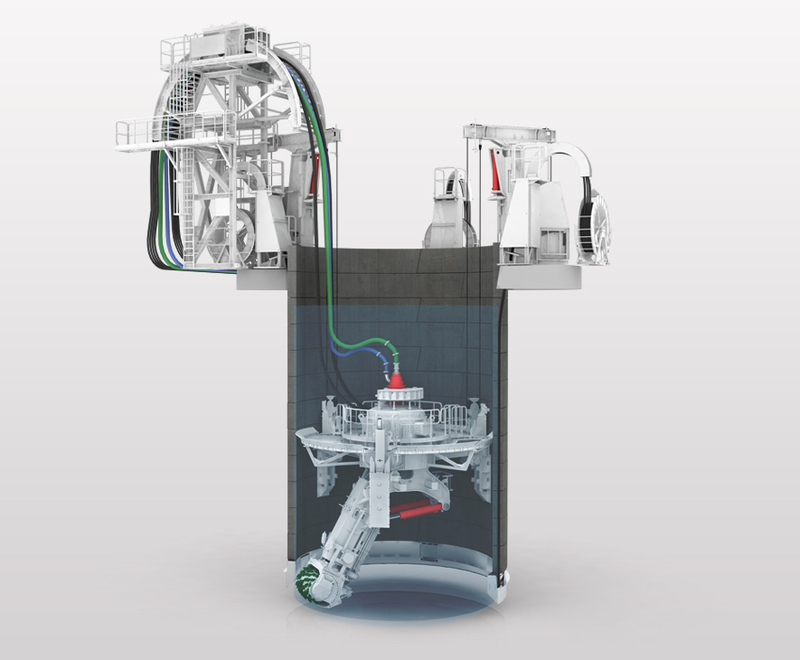 But in the interesting new world of tunnel technology, there’s a TBM for that: the “vertical shaft sinking machine”. It’s a machine that consists of an excavator at the bottom of the tunnel that removes the earth, and machines at the top that build the tunnel lining rings that are being pushed down from above. The trick here is that rings are installed at the top of the shaft and then the whole shaft is pushed down. It leaves a lot of the complex technology at the surface. It also means you don’t end up with a big machine at the bottom, without an escape: most TBMs can’t go backwards because they’re bigger than the tunnel they’re building, so they need an opening on the other end to escape the underground (or be taken apart at the end). At the bottom, the excavator can work under water, so the shaft can have the same ground-water level as the surrounding environment, until the desired depth is reached and the a concrete seal is poured at the bottom. With this machine it would be relatively simple to build access shafts for elevators, to access our hypothetical metro line. We could now build our subway line deep underground inside giant tunnels, and vertical shafts down to provide elevator accesses. The thing is, if you want a lot of people to access your station, you need escalators, which move many more people per hour. 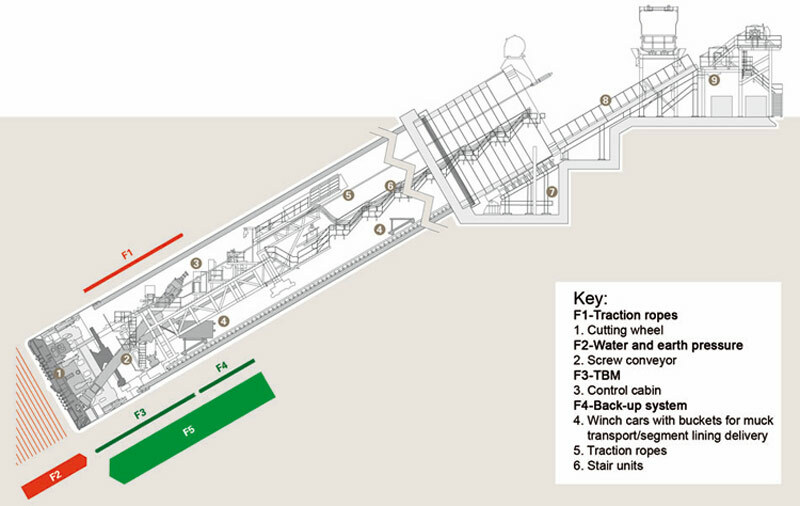 This means we want tunnels to be neither vertical or horizontal, but built at the 30 degree angle of escalators. 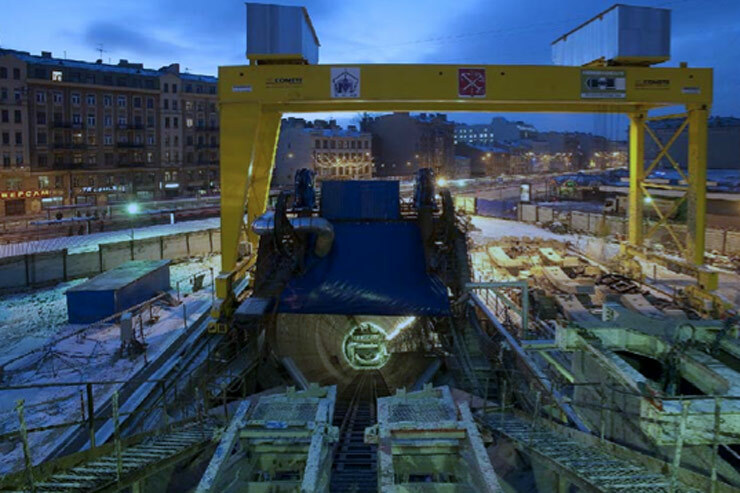 In 1997, Saint-Petersburg opened an extension of its line 5, very deep underground. But one 102m deep station, Admiralteyskaya, wasn’t opened until more than a decade later, because they couldn’t figure out how to build a connection to the surface. For all this time, trains just ran through this ghost station but didn’t stop there, since there was no connection to the surface. The problem was that there are a lot of museums and heritage buildings nearby and the ground is composed of a soft soil. The usual solution to freeze the ground and treat it like rock was deemed too risky, as the ground expansion from the freezing could damage the buildings (oh also, they ran out of money, and they had trouble finding a plot of land to use for the station). In the end, they came up with a tunnel boring machine that digs at an angle. 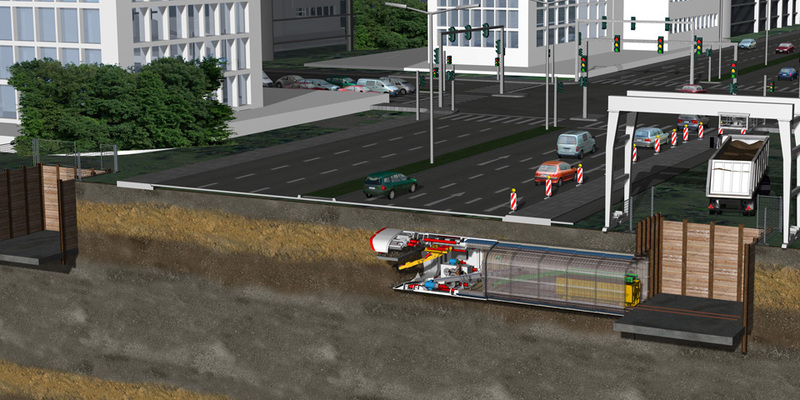 The machine takes away soil and immediately replaces it with a tunnel, minimizing movement of the ground. This allows digging without affecting the environment. In a way, building tunnels barely more than 100m with a TBM seems crazy. Setting up a tunnel “factory” only makes sense when you have a lot of tunnel to build. To make this economical, the TBM was made as re-usable as possible. Once the TBM reaches the bottom, most of it is disassembled and moved to the next site. The only thing that stays underground is the tunnel shield, the big protective metal sheath at the front of the TBM under which the tunnel lining is assembled – because it’s wider than the tunnel. In the end, three angled tunnels were built, at lengths between 105m and 160m allowing three new stations to open. The Admiralteyskaya station opened in 2011, about 14 years after the line itself. One issue with traditional TBMs is that they build tunnels with a circular cross section. But the internal cross-section of tunnels usually needs to be rectangular; generally we want a flat bottom, walls going straight up, with some relatively constant ceiling height. If we use a circular TBM to build a tunnel, we have a bunch of wasted space on the sides. This can be especially an issue when space is at a premium, or if we want to build tunnels as close as possible to the surface. This is especially true for underpasses, which have to be as close to the surface as possible and which also have a relatively small height (as little as 2.2m) but require a good amount of width (4m and more). Traditionally, these would be constructed using cut-and-cover: the road would be dug up, the tunnel placed in, and the road rebuilt on top. This can be a major disruption to the surface roads above. 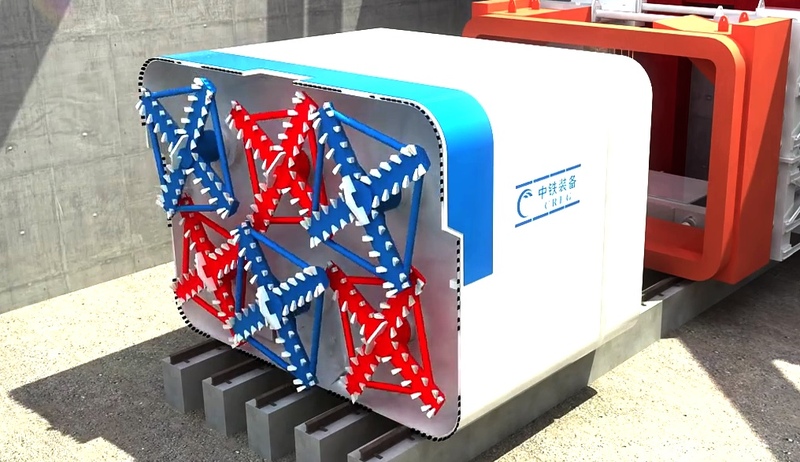 To deal with all of these issues, some tunnelling technology companies have started to offer a new kind of tunnel boring machine: the rectangular TBM. The idea, proposed by a German company but already built and used by a Chinese one, is to have a small rectangular digger. They can be used to build short, low-depth tunnels, in space-constrained environments, while minimizing surface impacts (which may also reduce costs). Rather than including a facility for assembling the tunnel lining (out of multiple segments) inside the TBM, complete rings are inserted at the insertion shaft, and the whole tunnel is jacked forward one segment at a time. This technology was used to build a metro access at the Havelock Metro Station in Singapore. The company hopes that this technology could be used one day to build whole stations. A station built using this rectangular TBM concept could be very interesting: unlike the ‘giant’ TBMs mentioned before, this technology could allow building stations close to the surface, in much more spatially constrained environments, and allowing a passenger platforms to be side-by-side rather than stacked. When building transportation systems, constraints are usually about physics, geometry and cost, not the technology (see my criticism of the “Gadgetbahn”). I think that we have to be careful of primarily technology-based “solutions” to transportation problems. Musk is trying to sell a quick-fix technology that in real life won’t be able to escape geometry and physics. His approach makes little sense, his understanding of cities is poor … but also, his technology is boring. On the other hand, technology can provide interesting tools to advance projects anchored in the real world, and push geometric, physical, time and cost constraints to its limits. 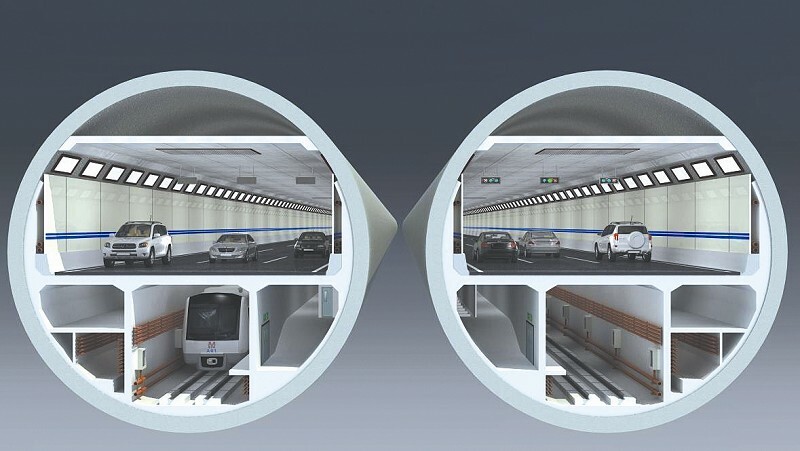 For more reading on tunnel technology, I recommend the website TunnelTalk, and the Tunneling Products Page of Herrenknecht, which I’ve both heavily linked in this article. 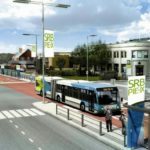 Ignoring concerns Is Montréal paying too much for BRT on Pie-IX?